The next sinister agent of N.O.W.H.E.R.E. is Harvest’s loyal right hand and also the daughter of the infamous mercenary, Deathstroke. Rose Wilson comes in with a beautiful sculpt wielding her twin swords. Every aspect of Rose is perfectly captured whether it be her deadly blades or her speed in battle. She truly makes for a very dangerous figure. Rose is 126 points and comes with a variety of abilities that make her a threat on the battlefield. First off, she has an ability called Incredibly Agile which allows her to ignore elevated terrain, hindering terrain and characters when moving. This means you can’t pin her down or corner her. She starts off with Running Shot and Penetrating/Psychic Blast so she can do some ranged damaged, but if she does get in close she’s got Toughness and an 18 defense which doesn’t make her easy to hit. And her Indomitable ability keeps her from taking pushing damage. In other words, you’ll get tired before she does. But they don’t stop giving her special abilities there. 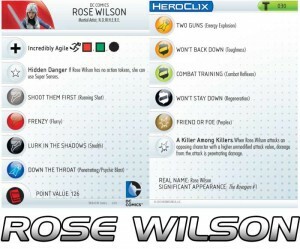 She also has an ability called called A Killer Among Killers which replaces Perplex on Rose Wilson’s damage slot. This ability reads, “When Rose Wilson attacks an opposing character with a higher unmodified attack value, damage from the attack is penetrating damage.” And even if you’re lucky enough to do damage to her, as you get into her last clicks she still has Flurry, Combat Reflexes, Stealth and Regeneration. All these abilities give me visions of her jumping through crowds of enemies, hacking and slashing and then getting away. 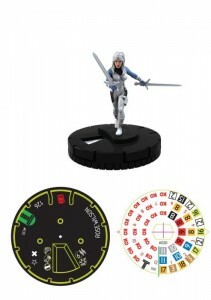 This entry was posted in News and tagged heroclix, ravagers, rose wilson. Bookmark the permalink.